The 9th ODI match of ICC Champions Trophy will be played on 14th June, 2013 at Sophia Gardens, Cardiff. The competing teams are South Africa and West Indies. This is a crucial match for both the teams. The winning team will find its place in the second semifinal spot. South Africa did not perform very well in its opening match with India but caught up in its match against Pakistan. 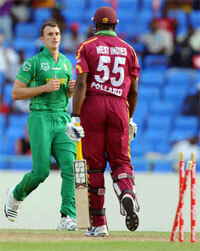 West Indies on the other hand has endured defeat in both its matches. This match will be a turning point. As West Indies Captain had recently commented on the rival team, it is certain that South Africa would look to shed their “chokers” tag and put forward an outstanding performance in order to break the tradition of failing to perform well on important matches. As South Africa and West Indies try to conquer the match, let us see which team's star will favor who and to what extent through Numerology. We will use Cheiro method of Numerology to make the predictions. This match will be played on 14th June, 2013. Moolank of this date is 5. As per Numerology, South Africa's Namank is 5. 5 and 5 share a cordial relationship. This is a positive indication for the team. Ab de Villiers is leading the team as Captain and his Namank is 9. 5 and 9 share a neutral relationship and this is neither a negative nor a positive sign for the team. This match will be played on the 14th of June, 2013 and the Moolank of this date is 5. As per Numerology, West Indies has Namank 1. 5 and 1 share cordial relationship. This is a positive indication for the team. The team's Captain is Dwayne Bravo and his Namank is 4. 5 and 4 share a neutral relationship. This is neither a negative nor a positive sign for the team. If we analyze on the basis of Moolank then both the teams have a favorable position. So far both the teams appear to be on the same plane. But this cannot be considered as the final result. We will now analyze the Sampoornank of the date, to draw a final conclusion. This match will be played on 14th June, 2013. Moolank of 14+06+2013, which we will call Sampoornank here is 8. According to Numerology, South Africa's Namank is 5. 8 and 5 share a cordial relationship; hence this is an auspicious indication for the team. Ab de Villiers, who is the Captain of the team, has Namank 9. 8 and 9 share a hostile relationship and this is a negative for the team. According to the Numerology, Namank of West Indies is 1. Since this match will be played on 14th June, 2013, Sampoornank of this date is 8. 8 and 1 share an inimical relationship. This is a negative sign for the team. Dwayne Bravo is the team's Captain and his Namank is 4. 8 and 4 share a positive relationship and this is a good sign for the team. In this manner we can see that even on the basis of Sampoornank, South Africa and West Indies appear to be on the same plane. But I have to declare one winner. We can see that the Moolank and Sampoorank are auspicious for South Africa. The outcome appears negative only from the Captain’s side. On the other hand Moolank is auspicious for West Indies but not Sampoornank. Hence I can conclude that South Africa will emerge victorious in this match. Rest is all in God's hand. But bear in mind, these are mere possibilities. Any action or risk taken on the basis of these possibilities is not advisable. The consequences of it will be borne by the risk taker.